Recurrent corneal erosion is the failure of the cornea‘s outermost layer of epithelial cells to attach to the underlying layer. 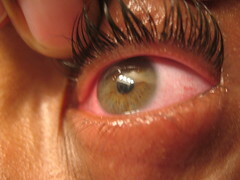 Due to loss of cells, and exposure of sensitive corneal nerves this condition is agonizing and painful. Recurrent corneal erosion may be due to corneal dystrophy or corneal disease, but is generally caused from a previous corneal injury. Some predisposing factors, such as diabetes or a corneal dystrophy, may be the underlying cause. New treatment for Recurrent Corneal Erosion is now available at Global Complex Eye Care. Utilizing amniotic membrane tissue, PROKERA® has natural therapeutic actions that help damaged or inflamed eye surfaces heal faster. Eyes treated with PROKERA® have quicker healing, less pain, less scarring, and less inflammation.The amniotic membrane in PROKERA® is thin and clear like the tissue on the surface of your eye and protects your eye’s damaged tissue while inserted. 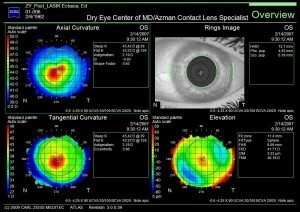 PROKERA® was developed to treat eye diseases such as recurrent corneal erosion, infectious/inflammatory keratitis, Herpes, superficial epithelial defects, severe dry eye syndrome, and other corneal diseases.s PROKERA® is a safe, effective treatment provided by a tissue bank regulated by the FDA. The tissue has passed many quality control tests before it is provided. This entry was posted in Scleral lenses and tagged Conditions and Diseases, Cornea, corneal dystrophies, corneal ectasia, corneal trauma, Descemet's membrane, Eye Disorders, Health, Ophthalmology, Recurrent Corneal Erosion on June 26, 2013 by Irwin Azman.